This week my son and brother have been playing RaiderZ. They really seem to enjoy it and I've been meaning to check it out for awhile now, so I thought what better time to do so. I just wanted to share some first impressions, screenshots, features and thoughts. This is an action based MMO. I would have to say it is most similar to TERA than any other game I've played, which wreaked havoc on my wrists but RaiderZ seems a bit more forgiving. Not every single mob required me to bounce, roll, dodge all over the screen. Personally I prefer games that do not require so much reaction for normal leveling, I play for relaxation but it is still a nice game. If it wasn't so action based I'd probably play it a heck of alot more, it has many neat features to it. Combat is interesting, and there are 'talents' letting you specialize in the paths you'd like to play. There are different archetypes; melee, tank, cleric, mage, but you can mix up what you want to do a bit. My son is a cleric but he plays ranged and I am more the melee type in this game, he kites while I get up close. There are options for how each person wants to play, which is always great. There is also multiclassing, after you spend initial points in your class tree. I'm not too experienced in this, my son has told me a bit about it, which he plans on working on this more as he levels. 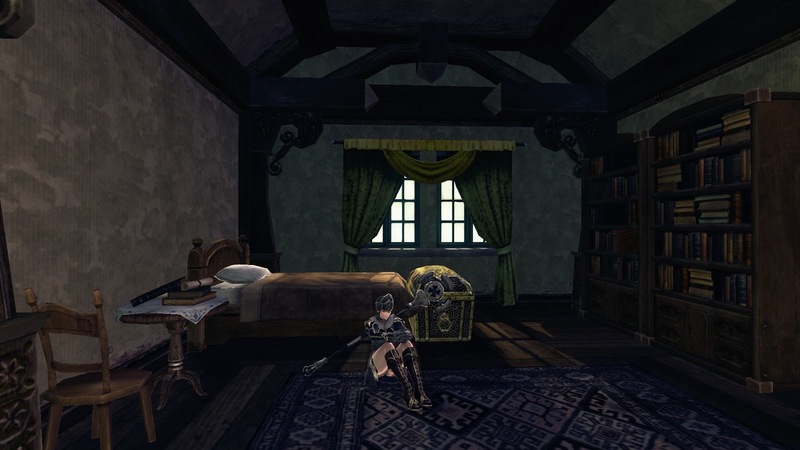 This game doesn't feature housing but you do get your own inn room. My brother thought that was really awesome- 'Hey I got my own Inn room!' I thought it was a rather nice touch, you can port back home there every thirty minutes or so. Nifty little feature to add a bit of personality to the game. Crafting. 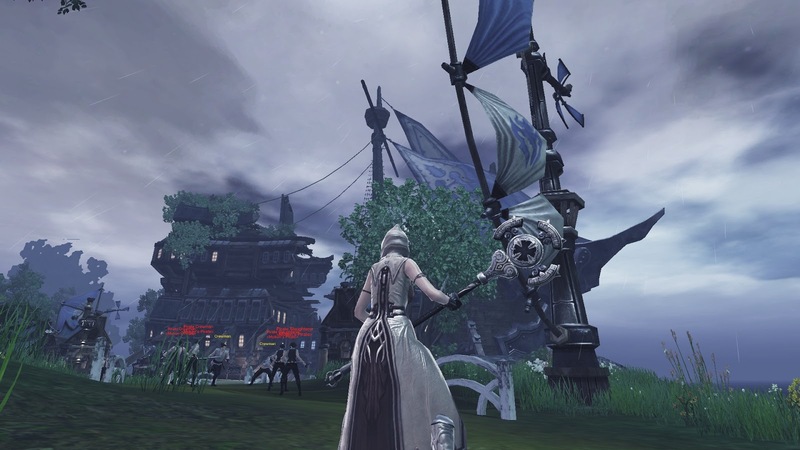 If you ever crafted gear in the first Guild Wars, RaiderZ works much the same way. You collect the materials and the NPC will craft your items. This is how it works within this game, you craft your items, weapons, as well as mounts. 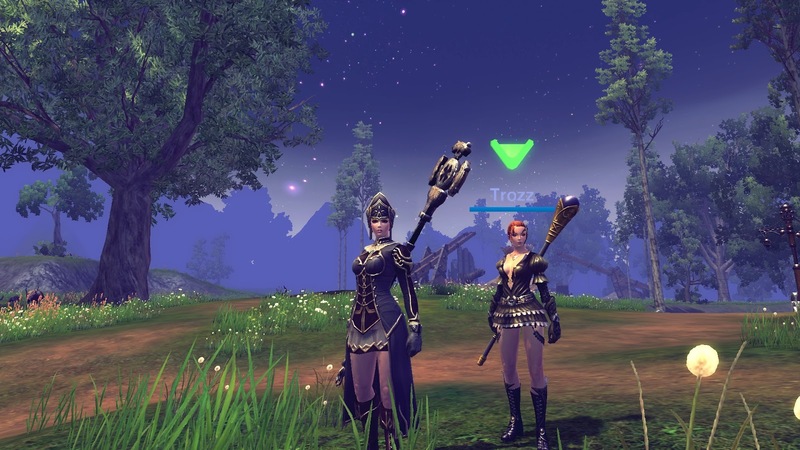 The armor from the get go is nice, as you level it seems to get even nicer looking, you don't have to wait until end game to look interesting, which was a big plus with my brother. He says he's sick of having to wait until end game to acquire cool armor and weapons, no waiting here.We liked the crafting aspect of the game, my son showed me the mats I'd need to collect and most of them I picked up as I was questing. No huge grinds, at least not in the early game. The game is pretty, it runs smoothly as well. It has nice surroundings, the characters are pleasant to look at, even if there is only one race option. The armor and weapons look fantastic. The mounts are some of the coolest I've seen. There were some that had me chasing people to get a closer look. There were neat little aspects in the game, such as people playing guitars and drums. I do not know much on those items but they looked like a lot of fun. The gameplay within this game is solid, especially if you like action based combat. I would prefer this over any of the others I've tried, it seems to have a bit more depth. The mouse is 'locked' much like most action based or ported games, I didn't seem to notice after a bit. The game also released an expansion this week! 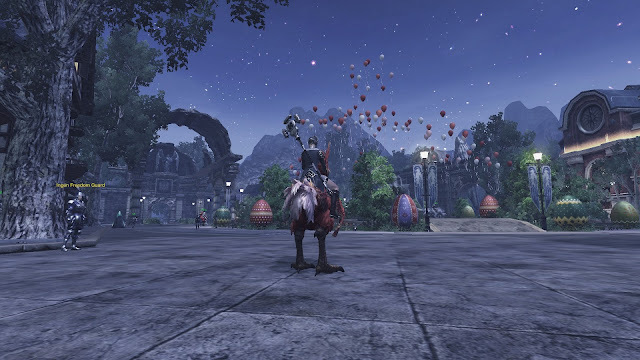 More levels, the starting area was revamped a bit, better rewards to new players starting off. Lots of neat things. 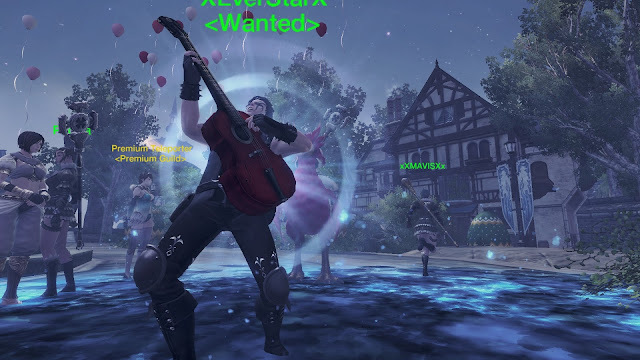 If you're looking for something interesting and fun to dabble around with, RaiderZ is pretty cool. I'm a bit of a PWE fan, so I knew it would feel like a quality game, and it does. Tons of questing, no huge grinds, all around a solid game. The game feels more skill based than gear based, which is refreshing. You can pick up weapons in the area, which are quite powerful and last a limited duration. I loved the cannon! I'm sorry bunny, I just wanted your ears. Rabbits can drop cosmetic ears to wear. Low drop rate though. 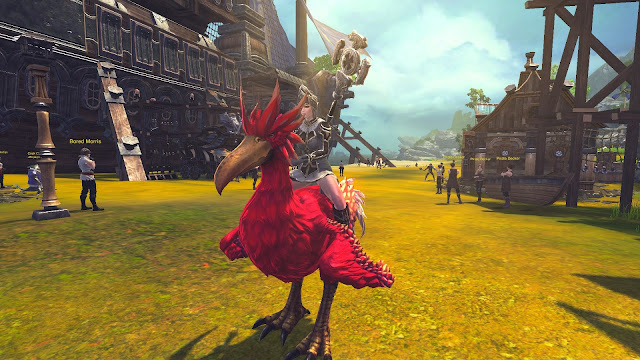 One of the mounts within the game, this one was a temporary but you can craft your first one around 12 or so. 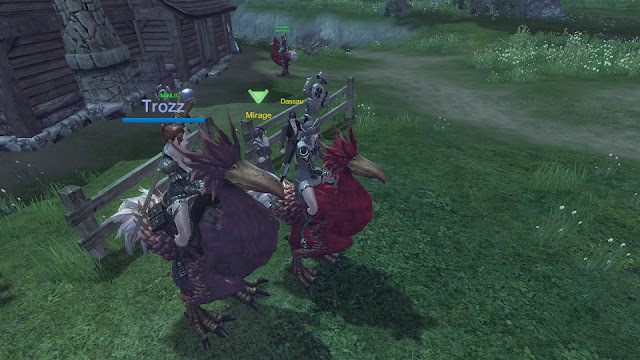 Whatever that chick is riding, I want one too. how cool is that... some creepy, crawly bug dude who carries you around?! Also people playing drums back there on the left. Broom mount, he also has a snake wrapped around his neck, that is awesome! Got me some new armor! He's jamming out! I want a guitar!! The first mount on the left is the first mount my son obtained. 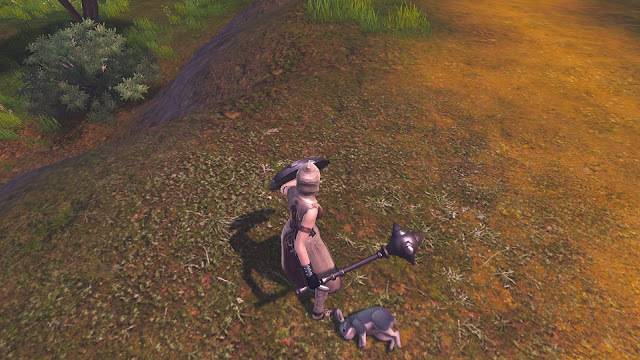 The second is my freebie mount.